As fellow "WOMMA":http://womma.org members, Eloqua engaged JESS3 to (1) help educate and inspire internal audiences about social media best practices and (2) take the resulting content and release it broadly online, free of charge. 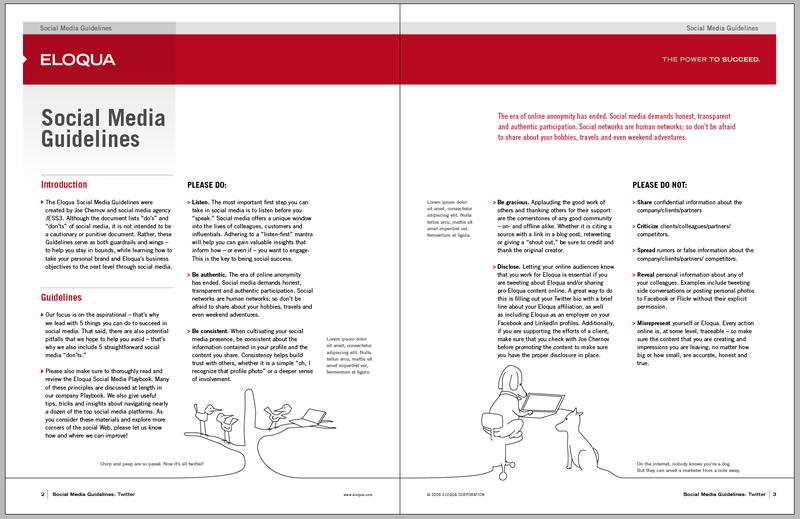 The outcome was a distilled Social Media Playbook, which in 42-JESS3-designed-pages, covers over a dozen platforms individually, as well as provides a tip sheet for integration, guidelines and ongoing engagement. Eloqua encouraged all to use and share the Playbook for any personal or professional use, and even suggested its contents be "remixed" in any way one might see fit. Distribution of the Playbook ranged from storage sites like Scribd and SlideShare, as well as social wildfire platforms like Twitter, blogs and Facebook. As a direct result of the Social Media Playbook, Eloqua saw a 43% increase in referrals to its corporate site from its blog.